If you’ve had a glass of wine with friends, odds are someone has described at as oaky. And perhaps you’ve heard a white wine described as having notes of green pepper. None of that happens because someone tossed a bell pepper into the wine as it was being fermented. Rather, it happens because of unique flavor, aroma and color compounds that make us just .1 percent of wine. The other roughly 99.9 percent is basically the same from wine to wine: water and ethanol, plus trace amounts of acids and sugars. And perhaps more than with any other drink, in wine, these tiny characteristics are what separates an average wine from one that is truly great. But don’t think that the differences you’re tasting are really being sensed by your tongue. 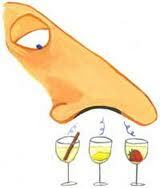 Sacks says with wine, and in general, most of what we call taste is actually coming from our nose. When we swallow, a puff of air comes back up, directing compounds into our nose, helping us perceive the differences in “taste” to whatever we’re eating or, in the case of wine, drinking. Hold you nose the next time you take a drink of wine and the uniqueness of the wine will disappear, leaving you with merely the sweet of the sugars, the sour of the acids and the bitter from the alcohol, Sacks adds.